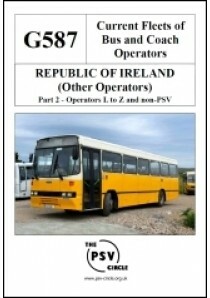 This publication is part of a series covering the Operators recorded in the PSV Circle Wales and Irish Republic News Sheet (area 8). It gives details of the known current fleets of all Other bus operators in the Republic of Ireland Part 2: L to Z. This has now been replaced by G687 and is reduced to clear while stocks last. 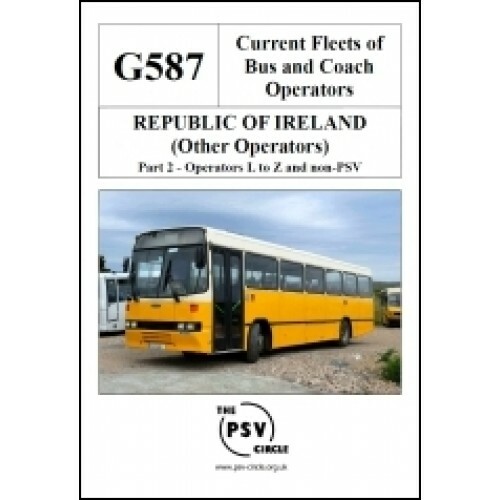 A Fleet List of All Major Bus and Coach Operators in Republic of IrelandThis publicat..
A Fleet List of All Other Bus and Coach Operators in Republic of IrelandPart 1: Operators&..
A Fleet List of All Other Bus and Coach Operators in Republic of IrelandPart 2: Operators&..
A Fleet List of All Other Bus and Coach Operators in Republic of IrelandPart 3: Operators&..
A Fleet List of All Other Bus and Coach Operators in Republic of Ireland Part 1: Oper..